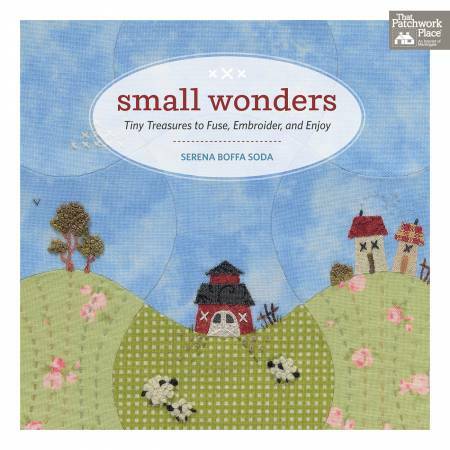 Peek inside the teeny-tiny world of Italian quiltmaker Serena Boffa Soda, a place where petite pleasures abound! Sweet sceneries inspired by the outdoors reveal delightful details upon a closer look: thumbnail-high houses complete with doors and windows, itty-bitty pumpkins ready to harvest, mini sheep grazing in a mini meadow, laundry hung on a pint-size clothesline, and birds the size of sunflower seeds taking flight—all worked in simple (yes, you can do it!) embroidery and fusible appliqué. One book, four projects, endless combinations--same-sized blocks throughout make it easy to switch designs from one project to another. Only basic sewing and embroidery skills are needed, and the pages are packed with how-to for every detail. As they stitch, quilters will learn what Serena knows to be true: it’s the little things that make all the difference. 80 pages.